Carte de L'Afrique Propre de la Numidie et D'une Partie de la Mauritanie. An unusual and attractive 1843 map of the ancient empires of Mauritania, Carthage, and Numidia shortly after the end of the Second Punic War. Depicts what is today known as the Barbary Coast around 190 BC. The Empire of Carthage has been annexed as a Roman Province named 'Africa Propria.' Numida, to the west of Carthage retains a semi-independent status because they allied with Rome in 206BC. Still further west, the kingdom of Mauretania has been established as the Roman Province of Mauretania Casariensis. Exhibits the typical detail and scientific precision of Lapie maps. Notes various trade routes, topographical features, and Oases. Prepared by Pierre A. Tardieu as plate no. 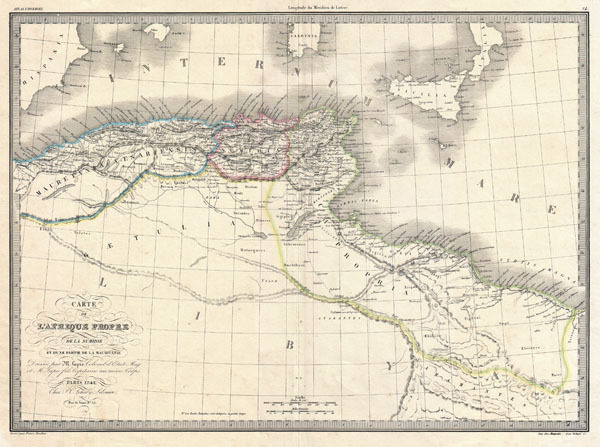 14 for the 1843 issue of Lapie's Atlas Universel de Geographie Ancienne et Moderne. Pierre Alexander Tardieu (1756 - 1844) was a prominent French cartographer and engraver operating in the mid-19th century. Pierre Tardieu's work is known for its detail and precision. Pierre Alexander Tardieu is frequently confused with both Jean Baptiste Pierre Tardieu and Ambroise Tardieu, two other unrelated French map and print engravers active in the late 18th and early 19th centuries. Lapie, P. and Lapie, A. E., Atlas Universel de Geographie Ancienne et Moderne, (1842 edition). Very good condition. Light overall toning. Original pressmark visible. Wide margins. Blank on verso. Rumsey 2174.014. Phillips (Atlases) 754 and 765.